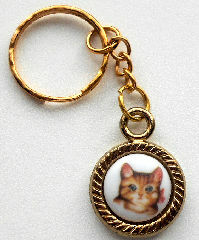 On this little key chain is an image of a striped orange kitten with a bow around its neck. The overall length of the key chain is 2 7/8". The fob with the ceramic insert of the kitten face is 3/4" wide. Previously owned but in good condition.